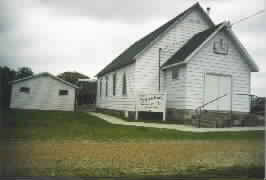 Founding of the Osceola Church of the Brethren began the first Saturday in March, 1886. The current building dates from 1896 and incorporates a slight "lean" caused when the framework was blown down in a windstorm and was righted using a team of horses. The original windows are still in place and are a little out of "plumb", so much so, in fact, that curtains have to be custom made to fit. in the inerrancy of the Bible, both in life and practice. The principles and concepts of the Word are most sought after, rather than the legalism of application. it is of paramount importance for each member to study on their own and bring their insights to the larger body so we might mature together and by so doing fulfill the Word by growing in grace and truth to a fuller knowledge of our Lord and Savior. the Last Supper with a communion and Love Feast each year on Maundy Thursday. We visit nursing homes and offer monetary assistance within the church and community. We have a scholarship program for those going into Christ centered work. of our love for food is our monthly fellowship dinner held after church services. Besides food, we enjoy the fellowship with one another. We express our love with hugs and kisses in the Brethren tradition.